1. 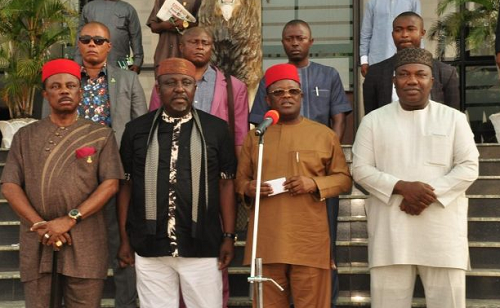 The attention of the South East Governors Forum has been drawn to the widely publicised ultimatum, credited to a coalition of 16 northern youth associations or groups, demanding that Ndi Igbo resident in Northern Nigeria should vacate the region within 90 days or before the 1st day of October, 2017; and equally urging northerners resident in Igboland to return to the North within the same time spectrum. 2. Typical of our preferred modus operandi, we have carefully considered the contents of the highly provocative statement and reflected on its implications for Ndi Igbo specifically, and for the status of the Federal Republic of Nigeria as a viable and sovereign nation generally. 3. This public statement is intended to accomplish a couple of objectives, one of which is the expression of our deep appreciation to all Nigerians, including the Presidency; the reputable socio-cultural group, Afenifere; the President of the Senate, His Excellency, Dr Bukola Saraki; His Excellency, Alh. Atiku Abubakar; our brother Governors particularly His Excellency, Alh. Kashim Shettima (the Chairman of Northern Governors Forum); Rtd. Gen. Abdulrahman Dambazau (the Honourable Minister of Interior); His Excellency, Mallam Nasir el-Rufai; the leadership of Arewa Consultative Forum (ACF); the security agencies and many others who have declaimed the dangerous threat by the misguided northern youth, and thus underscored the unity and oneness of this nation. 8. The rumours being peddled on conventional and social media platforms that we, the Governors of the South East, have met and agreed to mobilize vehicles and cash for the repatriation of Ndi Igbo resident in northern Nigeria must be disregarded, as they are nothing but tissues of lies. No amount of provocation would lead us to such a precipitate and irresponsible action at this time. Those exploiting such vacuous tittle-tattle as a basis for divisive rhetoric in public spaces are simply playing juvenile politics and we urge them to cease and desist. 9. Long live Ndi Igbo! Long live the Federal Republic of Nigeria!